This Kreature will construct enormous hives underground. It is a swift, agile, heavily armoured predator with a fearsome reputation. Not only does Its sting contain venom that induces paralysis and necrosis, it also injects an alarm pheromone that will attract others of its kind. 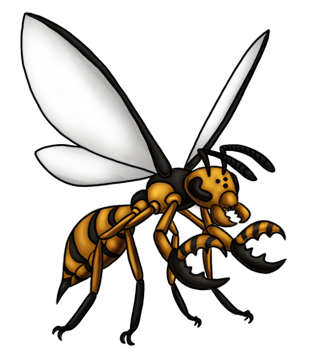 The entire colony will swarm over the enemy, attacking with reckless disregard for their own lives until the intruder has been slain or driven away. While hunting, it prefers to dispatch prey with its mandibles and pincers so it can conserve its venom. A wasp monster with not only two different types of venom, but large shearing pincers and weighs forty five pounds…. Yeah, I’d make it my business to evacuate the area immediately if one of these showed up.